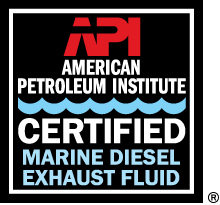 An API Diesel Exhaust Fluid Certification is a marketer’s testament to its conviction to the environment, its assurance of quality, and its dedication to helping industry meet the EPA diesel engine emissions requirements. With an API Diesel Exhaust Fluid (DEF) License, a marketer shows its customers first-hand that it believes in manufacturing DEF that meets rigorous industry requirements for DEF purity. The use of the marks also identifies the DEF marketer as the marketing organization responsible for the integrity of a brand name and the representation of the branded product in the marketplace. Complete product information for the fluid or fluids to be licensed (brand names, supplier information, and traceability codes for packaged products). Note that API will not allow licensed company names or brand names that contain any reference to API, ISO, or any terms that infer API endorsement (for example, the terms “certified,” “approved,” “licensed,” “accredited,” “endorsed,” “qualified,” “verified,” etc.). For help with a DEF application or an account, you can download the DEF User Guide. Please be aware, the online system will not permit an invoice to be generated until at least one DEF product has been submitted for API review. API reviews applications only after full payment has been received. 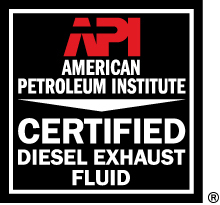 An applicant may not display the API Diesel Exhaust Fluid Certification Mark or API Marine Diesel Exhaust Fluid Certification Mark on any product or refer to the fluid as API certified, licensed or approved until the applicant has signed the legal agreement, paid the application fee, and received notice from the API online system that the product has been licensed. API assesses an application fee of $7,500 USD for all new applicants. Payment of this application fee enables the marketer to apply for either a DEF or Marine DEF license or both and the marketer may submit applications for as many products as desired at no extra cost. API assesses an annual renewal fee of $7,500 USD. Licensees must renew annually before the license expires on March 31. API also assesses an annual royalty fee of $0.001 per US gallon of API-licensed DEF reported. As part of the renewal process, the licensee must submit volumes of API-licensed DEF sold during the previous year of licensing. If licensed in both programs, the licensee must report the volumes of DEF and Marine DEF separately. The licensee will be able to submit volumes and complete the renewal after January 1 of each year. The new DEF fee structure—effective December 15, 2015—is shown below and can be downloaded. Licensing fees are reviewed annually and are subject to change. At time of annual license renewal, licensee must separately report volumes of API-licensed DEF and Marine DEF sold. API assesses $0.001 per gallon fee on each gallon reported. Licensed diesel exhaust fluids sold in packages and in bulk must be included in volume report. Every license issued is testament to your conviction to the environment, your assurance of quality, and your dedication to meeting EPA diesel engine emissions requirements. With an API DEF License, you can show your customers first-hand that you believe in manufacturing DEF that meets rigorous industry requirements for DEF performance.